Clear to partly cloudy. Low 58F. Winds light and variable..
Clear to partly cloudy. Low 58F. Winds light and variable. 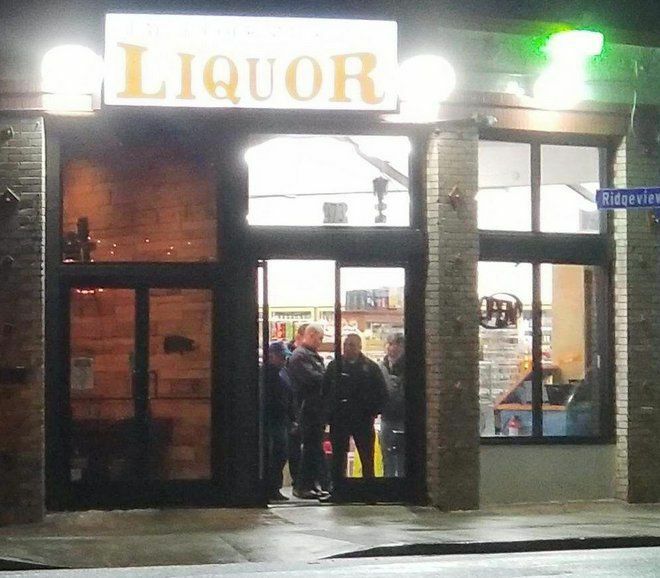 Officers investigating Eagle Rock Boulevard liquor store robbery | Photo by Danny N.
Two liquor stores in Eagle Rock and Highland Park were held up by armed robbers about an hour apart on Wednesday night following a string of robberies in the area. A reader provided information on the first incident that occurred at about 8:30 p.m. at a liquor store in the 4700 block Eagle Rock Boulevard in Eagle Rock near Ridgeview Avenue. Two armed robbers wearing ski masks with a skull print on the front demanded money from the store’s employee. The suspects got away with an unknown amount of cash and the cashier’s cell phone. Police believe those same suspects also robbed a Highland Park liquor store in the 5000 block of Monte Vista Street about an hour later. Sgt. Morales with the LAPD’s Northeast Division said the description of the suspects matched those of the suspects in the Eagle Rock Boulevard robbery. It is an unsettling time for businesses in Northeast L.A. Armed robbers held up a cell phone store on Colorado Boulevard on Tuesday night and, last month, burglars struck five Colorado Boulevard businesses in one night. Suspects have been arrested in January’s burglaries. Morales could not confirm if the Wednesday night’s robberies were linked to Tuesday night’s robbery on Colorado Boulevard. Last month, burglars struck five Colorado Boulevard businesses in one night. The strip has proven a tempting target over the years given its proximity to freeways, unprotected windows and the lack of other other security measures, says the Boulevard Sentinel.